Have you ever replaced an existing bulb with a new bulb? If so, then you might have noticed the change in illumination of your room. This change occurs according to the output of those bulbs which vary in wattage. The more Watts a bulb has the more brightness it delivers. The same concept applies to LED Bulbs too. The only difference is that their light output is measured in Lumens rather than Watts. Install more than one bulb in the same room which varies in their lumens, light them up and see the difference for yourself. If you feel the difference in brightness that means you are experiencing the variation in color temperature of lighting appearance. It is not any different than the light you experience in the morning, in the evening and at day time when the color of the sky is blue. It’s only the technical term given to LED lights to measure brightness level. LED Lights are categorized based on the color temperature. Technically, it is measured on a scale which is measured in Kelvin (K) even though we differentiate it on the basis of warm and cool appearance. It is measured on the scale from 1,000K to 10,000K provided that the light is switched on. A low reading on the scale indicates the warm appearance of light is yellow. The further reading on the scale is in order of colors variation i.e. from red to orange, then yellow, white, blue-white, and at last darker shades of blue. The higher temperature is considered as cool appearance. Hence, the lower readings are mentioned as warm colors and the higher as cool colors of which blue is the coolest. The measured reading in Kelvin is called CCT (Correlated Color Temperature). During the day, the natural color of sun’s light can be also measured on the color temperatures scale. At sunrise, it is warm and in the middle of the day, it is cool (Blue) color temperature. 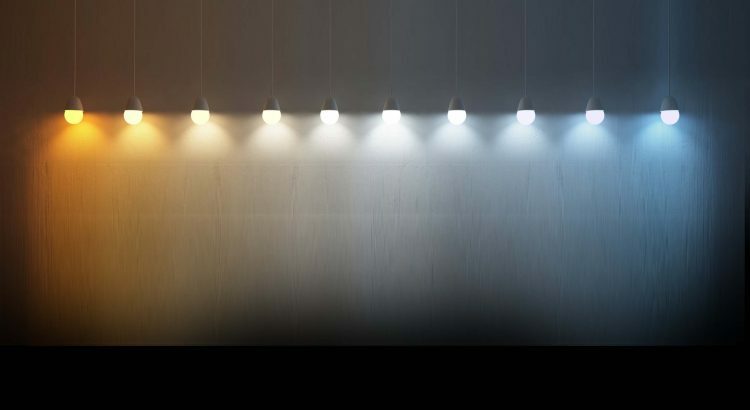 According to a study, it is found that LED lighting has positive health effects on humans if the recommended color temperature is chosen for every living place. In the living room, use warm lights as the sun’s color is warm at the time of morning and evening, and it’s the place we spend our time in the mornings and evenings. At the workplace, use cooler light as during the day light you stay there. The common places for this range are Living rooms, Restaurants and Hotels. This temperature creates an ambiance like the lighting at the time of sunset. This warm white color is perfect for getting cozy, intimate or relaxing a bit. This soft white color is suitable for Bathroom and kitchen lighting. This is a good choice for relaxing and for a calming environment. This neutral white color range is best for office or workplace lighting. This is also suitable if you need to stay alert and keep your focus. This Cool white color is for Garages, Retail or Grocery stores, and warehouses to enhance the efficiency of workers. This color temperature is also perfect to be used in clinics and hospitals. This temperature is similar to day-lighting. It can create a vibrant, refreshing and energetic mood to your utility area. You can also take the advice of the lighting experts to select the right color temperature for every area. by chɑnce (ѕtumbⅼeupon). I have saved it for later!